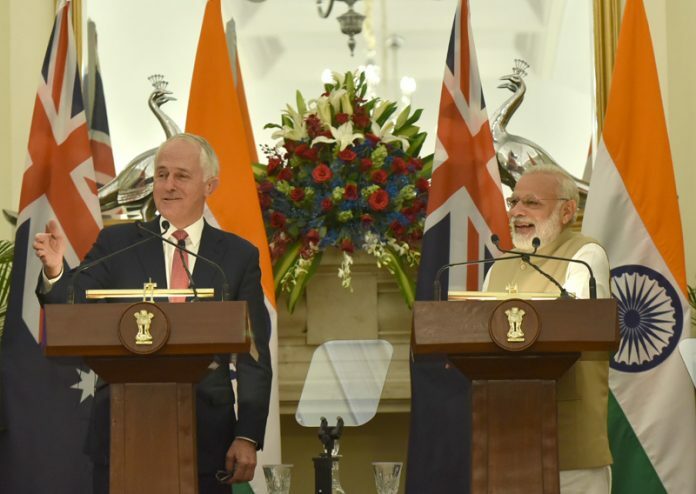 The Prime Minister, Shri Narendra Modi and the Prime Minister of Australia, Mr. Malcolm Turnbull at the joint press statement, at Hyderabad House, in New Delhi on April 10, 2017. New Delhi: Prime Minister Narendra Modi along with Australian Prime Minister Malcolm Turnbull, inaugurated the world’s most advanced nanobiotechnology research centre, a joint venture between The Energy and Resources Institute (TERI) and Deakin University, Australia. “The cooperation in the field of education and research is the most important field of engagement between India and Australia. TERI-Deakin Nanobiotechnology Research Centre is a classic example of the kind of cutting edge research being done by the two countries. The $100 million Australia-India Strategic Research Fund is for collaborative research in areas such as nanotechnology, agriculture, food security, smart cities, etc. Our joint research has entered the phase of field trials and this outstanding science cooperation is firmly rooted in tangible outcomes, that is, to improve the lives of millions.”, Hon’ble Prime Minister Narendra Modi said while digitally inaugurating the TERI Deakin Nanobiotechnology Centre. The TERI-Deakin Nano Biotechnology Centre (TDNBC), established at Gwal Pahari, Gurgaon, aims to support and nurture innovative ideas for existing problems of Indian agriculture amongst other sectors. In 2010, The Energy and Resources Institute, India, and Deakin University, Australia, signed an agreement to establish a joint Centre of Excellence, the TERI-Deakin Nano Biotechnology Centre (TDNBC) to foster cutting-edge research around sustainable agriculture, which was achieved through establishment of a laboratory worth AU$7.8 million at TERI Gram, Gwal Pahari, Haryana, India. The centre is an expansion of Deakin University’s ongoing ‘Deakin India Research Initiative’. This Centre has also been rated as a 5-star GRIHA building; it is an example of resource efficiency and smart future. The Class 10000 and 1000 controlled environment Centre is spread over 5 acres of land and houses high-end scientific equipment like Nano particle analyser (XETA sizer), Lazer scanning microscope (Confocal), Scanning electron microscope (SEM), and Transmission Electron microscope (TEM). While addressing the media, Prof. Jane Den Hollander, Vice Chancellor and President of Deakin University, Australia, said, “We are delighted to partner with TERI for building scientific temper and bringing new innovations in the field of science and technology. Deakin is passionate about supporting the communities we serve and ensuring our graduates are prepared for the jobs of the future, in a global environment.